2 Language percentages add to more than 100 percent because some people speak more than one language. They exclude unusable responses and those who spoke no language (e.g. too young to talk). 3 There is a multitude of dates that could be considered to mark independence. 4 The proportion of New Zealand's area (excluding estuaries) covered by rivers, lakes and ponds, based on figures from the New Zealand Land Cover Database, is (357526 + 81936) / (26821559 – 92499–26033 – 19216) = 1.6%. If estuarine open water, mangroves, and herbaceous saline vegetation are included, the figure is 2.2%. 5 The Chatham Islands have a separate time zone, 45 minutes ahead of the rest of New Zealand. 6 The territories of Niue, the Cook Islands and Tokelau have their own cctlds, .nu, .ck and .tk respectively. New Zealand is an island country located in the southwestern Pacific Ocean. It is also called Aotearoa or the "Land of the Long White Cloud" in the language of the Maori (rhymes with "dowry"), the Polynesian people who settled the islands four centuries before the first Europeans arrived. Geographically, the country consists of two large islands and a number of smaller islands. It is separated from Australia to the northwest by the Tasman Sea, which is some 2,000 km across. The closest neighbors to the north are New Caledonia, Fiji, and Tonga. New Zealand's total land area, nearly 270,000 km², is about the same as that of Colorado and somewhat smaller than the Philippines. The population, in slight excess of four million, is similar in size to Costa Rica's. The two main islands are named North and South islands in English, or Te-Ika-a-Maui and Te Wai Pounamu, respectively, in Maori. Maori legends describe South Island as a canoe and North Island as a fish. New Zealand aligned itself with the allied nations in World War I, World War II, and the Korean War. In the First World War, New Zealand recorded the highest casualties per head of population of any combatant nation. New Zealand's landscape ranges from the fjord-like sounds of the southwest to the tropical beaches of the far north. South Island is dominated by the Southern Alps, the highest peak of which is Aoraki/Mount Cook, at 3,754 m. The closest mountains surpassing it in elevation are found not in Australia, but in New Guinea and Antarctica. The tallest peak on North Island is Mount Ruapehu (2,797 m), an active, cone-shaped volcano. Smaller islands include Stewart Island, which lies south of South Island; Waiheke and Great Barrier islands, near the north end of North Island; and the Chatham Islands, more than 800 km east of South Island. Temperatures rarely fall below 0°C or rise above 30°C. Conditions vary from wet and cold on South Island's west coast to dry and continental a short distance away across the mountains and subtropical in the northern reaches of North Island. 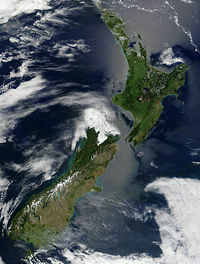 A satellite image of New Zealand. Lake Taupo and Mount Ruapehu are visible in the middle of North Island. The Southern Alps and the rain shadow they create are clearly visible on South Island. 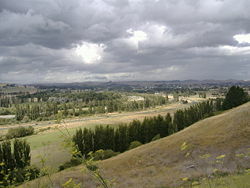 New Zealand countryside: Waipukurau district is the heart of a sheep and cattle region on the east coast of the North Island. New Zealand also includes the Cook Islands and Niue, each lying about 2,200 km to the northeast and entirely self-governing; Tokelau, another island territory situated about 3,200 km to the north and moving towards self-government; and Ross Dependency, New Zealand's claim in Antarctica, located about 2,500 km to the south. Because of its long isolation from the rest of the world, New Zealand has unique flora. Evergreens such as the giant kauri and southern beech dominate the forests. It also has a diverse range of birds, including the flightless moa (now extinct) and the kiwi, the kakapo, and the takahē, all of which are endangered. Human settlement had a huge impact on fauna and flora. Over 75 percent of the forest cover has been burnt or felled, and the land converted into pasture. Many bird species, including the giant moa, became extinct after the arrival of Polynesians, who brought dogs and rats, and Europeans, who introduced additional dog and rat species, as well as cats, pigs, ferrets, and weasels. The kiwi, a flightless bird, is one of New Zealand's most famous species and a national icon. Conservationists recognized that threatened bird populations could be saved on offshore islands, where, once predators were exterminated, bird life flourished again. Around 30 species are listed as endangered. 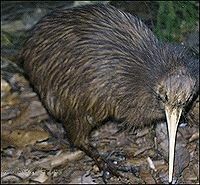 The kiwi, a national symbol, is also under threat. A curious bird, it cannot fly, has loose, hair-like feathers and long whiskers, and is largely nocturnal. New Zealand's landscape has appeared in television series such as Xena: Warrior Princess. An increasing number of movies have also been filmed there, the most well-known being the hugely successful Lord of the Rings trilogy, which took cinematic advantage of the dramatic scenery in various parts of the country. The relative proximity of New Zealand to Antarctica has made South Island a gateway of sorts for scientific expeditions and tourist excursions to the icebound continent. 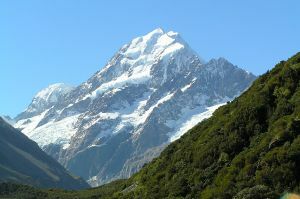 Aoraki/Mount Cook is the tallest mountain in New Zealand. Evidence indicates human settlement began in the thirteenth century C.E., and those first settlers, the Maori, comprised up to 200 men and women from eastern Polynesia who arrived in canoes. DNA mapping of their Maori descendants indicates links to the indigenous people of Taiwan. The Moriori people of the Chatham Islands, located to the east of the main islands, multiplied from a group of New Zealand Polynesians who traveled there by canoe in the fourteenth or fifteenth century. The Maori called the North Island Aotearoa, a name which is now the most widely known and accepted Maori name for the entire country. Tribal culture developed in the sixteenth century. Individuals identified with their family (whanau) and tribe (iwi), membership of which was traced to the canoe an ancestor arrived in. There were paramount chiefs (ariki), chiefs (rangatira), commoners (tutua), and slaves. Both aristocrats and commoners could increase their status (mana) by becoming experts (tohunga) in activities of a physical, artistic, or spiritual nature. The country was divided into tribal districts (rohe). They were a savage, warrior people who practiced cannibalism. Abel Janszoon Tasman, the commander of a two-ship Dutch East India Company trading expedition, was the first European to visit. An encounter with two canoes full of Maori warriors in 1642 led to the deaths of four Dutchmen. Tasman did not set foot on land. He named that area Murderers’ Bay, and called the country Staten Landt. This was changed by Dutch cartographers to Nova Zeelandia, after the Dutch province of Zeeland. Lieutenant James Cook, of the British Royal Navy, brought the next European contact in 1769. Cook mapped the main islands and the east coast of Australia, and named the country New Zealand. He recognized the relationship between the Maori and the Tahitian people his expedition had already visited. In the same year as Cook's first visit, French explorer Jean de Surville conducted the first Christian service in New Zealand waters on Christmas Day. The first Europeans to live in New Zealand were seamen who jumped ship, convicts who had escaped from British penal colonies in Australia, sealers, whalers, and traders. Timber and flax attracted traders and led to tribes acquiring muskets, initially for hunting, but inevitably were wielded in inter-tribal fighting known as the Musket Wars, in which more than 20,000 were killed over 30 years. The first missionary was Samuel Marsden, sent by the Church Missionary Society in 1814 to evangelize the Maori. Successive missionaries were eventually able to broker peace between the warring tribes and end the practice of slavery and cannibalism. The Treaty of Waitangi was concluded between the British government and Maori chiefs in early 1840. In the three-sentence treaty, the chiefs ceded to the Queen the government of their lands; the monarch in turn acknowledged that the chiefs and tribes owned their lands, and if they wished to sell, had to sell to an agent in the Queen's service. The crown also promised to protect Maori people as British subjects. But unresolved disputes over land ownership and sovereignty led to a series of armed clashes, known as the Maori Wars, the NZ Wars, or the Land Wars, which continued until 1872. New Zealand was initially administered as a part of the colony of New South Wales. Sir George Grey was the first governor with the resources to enforce the rule of law. His Constitution Act of 1853 set up a national system of representative government and a prime minister. Voters had to be male owners of property. The governor retained responsibility for Maori affairs, and foreign policy was controlled by Britain. From 1867, all Maori men could vote, and from 1893, all women could vote. The ballot was secret from 1870, and the property qualification was abolished in 1879. The first capital was in the Bay of Islands, in the far north, but soon moved to Auckland. European settlement progressed rapidly, and by 1860 Europeans outnumbered Maoris. The discovery of gold on South Island in 1861 sparked concerns that settlers there would form a separate colony, so in 1865 the capital was moved to the more central city of Wellington. New Zealand became an independent dominion in 1907. Full independence was granted with the Statute of Westminster in 1931, which was adopted by the New Zealand parliament in 1947. Since then, the country has been a sovereign constitutional monarchy within the Commonwealth of Nations. New Zealand recorded the highest casualties per head of population of any combatant nation during World War I, when 100,000 served and 17,000 were killed. In World War II, 204,000 served and 11,500 were killed, and in the Korean War, 1,550 served and 38 were killed. For 100 years, New Zealand followed Britain's lead on foreign policy. However, British inability to protect the country from Japanese aggression in World War II began a period of American influence. New Zealand is a party to the ANZUS security treaty between Australia, New Zealand, and the U.S. The formal relationship with the U.S. changed, in 1986, however, after the Labour government adopted an anti-nuclear position, which ended visits of American warships. New Zealand dismantled its air combat capability in 2001. It has contributed forces to various peacekeeping missions—in Cyprus, Somalia, Bosnia and Herzegovina, the Sinai, Angola, Cambodia, the Iran/Iraq border, Bougainville, and East Timor. After financial reforms in 1984, successive governments transformed New Zealand from a highly protectionist and regulated economy to a liberalized free market economy. The government sold its telecommunications company, railway network, a number of radio stations, and two financial institutions. The businesses the government retained, known as "state-owned enterprises," are required to operate profitably as stand-alone businesses. An economic bubble developed in the New Zealand stock market starting in 1984. After it burst in 1987, the total value of the market fell by half within a year. A period of poor economic growth lasted until the mid-1990s, when the government began a program of immigration to boost GDP. A favorable rate of currency exchange and strong demand for housing buoyed the economy for the next six years until inflationary pressures in 2005 caused the central reserve bank to raise interest rates. The government's economic objectives, from 1999 to 2002, aimed to move the country up from the lower ranks of the developed nations, pursue free-trade agreements, close the gaps between Maori and others, and build a "knowledge economy." In 2004, it began discussing free trade with China, which is New Zealand's fourth-largest trading partner. A deal is expected to eventually increase New Zealand exports by 40 percent. In 2005, agriculture made up about 5 percent of gross domestic product; industry, 28 percent; and services, 67 percent. New Zealand is dependent on trade—particularly in agricultural products—and has been affected by global economic slowdowns and slumps in commodity prices. Primary export industries are agriculture (sheep, cattle, dairy), horticulture (apples, kiwifruit), fishing, and forestry. Since agricultural exports are sensitive to currency values and most consumer goods are imported, any changes in the value of the New Zealand dollar have a strong impact on the economy. The possibility of adopting Australian currency or the U.S. dollar has been suggested. The national economy has seen many changes in recent years. New Zealand once had about 20 times more sheep than people; by 2001 there were only 12 times as many. During the 1990s, tourism became the country’s leading earner of foreign exchange. The number of overseas students receiving education in New Zealand expanded dramatically and the importance of "export education" to the national economy rivaled that of other more established industries. Vineyards have proliferated since the 1990s in areas of the country, with a focus on high-quality sauvignon blanc and pinot noir. About 70 percent of New Zealand's population is of European descent, mostly English, Scottish, Welsh, Irish, and Dutch. Those of full or part-Maori ancestry comprise about 15 percent and Asians make up nearly 7 percent, while those of Pacific Island origin constitute 6.5 percent. British migrants form the largest single group (30 percent), but new migrants are drawn from many nations, increasingly those of East Asia. A result of Pacific Island immigration is that South Auckland has become the world's largest Polynesian city. English and Maori are the two official languages, although most visitors would find New Zealand exclusively an English-speaking country. The Maori language is used on sign posts, at Maori culture concerts, as secondary names of government departments, on the Maori-language television channel, and on a number of tribal radio stations. Successive government policies on the relationship between Maori and non-Maori people have worsened race relations. After 1840, many issues to do with sovereignty and land ownership remained unresolved and, for a long time, invisible while Maori lived in rural communities. Agitation regarding treaty issues intensified in the 1970s. The Waitangi Tribunal was set up in 1975 to consider alleged breaches, and in 1984 was empowered to look back to 1840. In 20 years, a grievance industry has ballooned, generating hostility from voters. Christianity is the predominant religion in New Zealand, although nearly 40 percent of the population has no religious affiliation. The main Christian denominations are Anglican, Presbyterian, Roman Catholic, and Methodist. Significant numbers identify themselves with Pentecostal, Baptist, and the LDS (Mormon) church. The Ratana church has many adherents among Maori. Increasing immigration since the late 1990s brought adherents of Hinduism, Buddhism, and Islam. British colonists brought a legal, political, and economic system that has flourished, along with the English system of agriculture that has transformed the landscape. The British brought the Protestant work ethic—the industrious newcomers astonished Maori people. In return, settlers noted the athletic ability, musicality, and courage of the Maori. However, English paternalism soon brought an extensive welfare system that created a large, poor Maori underclass. 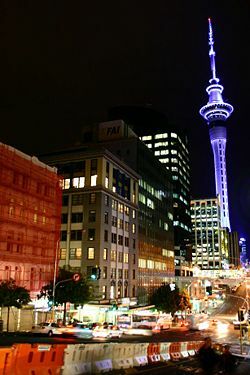 Cultural links between New Zealand and Great Britain are maintained by a common language, sustained immigration from the UK, and the fact that many spend time in Britain on the "overseas experience," known as "OE," that young adult New Zealanders are practically expected to undertake before returning to settle down in their remote corner of the world. Today, the government promotes Maori culture by supporting Maori-language schools, by ensuring the language is visible in government departments and literature, by insisting on traditional Maori welcomes (powhiri) at government functions and state school award programs, and by having Maori run the welfare services targeted at their people. Rugby union is the national sport. The national rugby team, the All Blacks, has the best winning record of any national team in the world, including being the inaugural winner of the 1987 Rugby Union World Cup. New Zealand is to host the 2011 Rugby Union World Cup. The country's national sporting colors are black and white, and the silver fern is a national emblem. The All Blacks perform a traditional Maori war dance, or haka, before the start of international matches. Other popular sports are cricket, netball, lawn bowling, soccer, golf, tennis, cycling, and a variety of water sports, particularly sailing, whitewater kayaking, surf lifesaving, and rowing. Snow sports such as skiing and snowboarding are also popular. New Zealand hosted the last two competitions for international yacht racing's top prize, the America's Cup (2000 and 2003), by virtue of being the home of the winning team in 1995 and 2000. The country has the distinction of being the only one outside the U.S. to hold multiple America's Cup races, but lost the cup in 2003 to a Swiss team (with a New Zealander skipper). New Zealanders, known internationally as “Kiwis,” are distinctive for their twangy dialect of English and propensity to travel long distances, and are quickly associated with the All Blacks rugby team and the haka. A tradition of resourcefulness came from the pioneering backgrounds of both European and Maori colonists. ↑ Central Intelligence Agency, New Zealand The World Factbook. Retrieved October 28, 2017. ↑ 2.0 2.1 2.2 2.3 New Zealand International Monetary Fund. Retrieved October 28, 2017. ↑ New Zealand's National Anthems Ministry for Culture and Heritage. Retrieved October 27, 2017. ↑ Protocol for using New Zealand's National Anthems Ministry for Culture and Heritage. Retrieved October 28, 2017. ↑ QuickStats About Culture and Identity: Languages spoken Statistics New Zealand, March 2006. Retrieved October 28, 2017. ↑ The New Zealand Land Cover Database New Zealand Ministry for the Environment. Retrieved October 28, 2017. This page was last modified on 28 October 2017, at 21:10.